This is an 8 inch fully articulated Wendy doll with a specialty box..
We are pleased to share "Alice's Mad Adventure" from the Storyland Collection from Madame Alexander. Celebrate the 150th Anniversary of Alice and her Wonderland adventures! Alice is an 8 inch Wendy doll with a fully-articulated vinyl body. She wears a lovely blue gown and white lace apron. In her hand, she holds a special top hat made by the Mad Hatter himself. 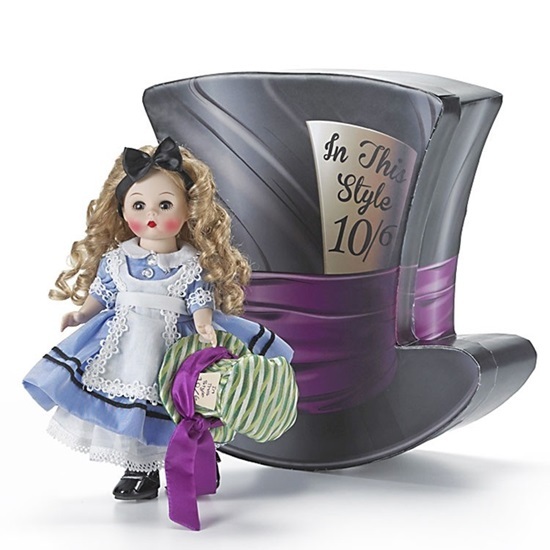 As a special touch for this 150th anniversary, Alice arrives packaged in a special box in the shape of Mad Hatter's top hat rather than the traditional Madame Alexander box. Suitable for ages 14 and up.